Looking to break a sweat? Want to see some exciting, edge-of-your-seat tennis matches? Head to the Florida Tennis Center! It’s the hub of Daytona Beach tennis, conveniently located just across the road from the world-famous LPGA International golf course. Several incredible tennis legends have tasted victory right here on these courts. Each year, the Florida Tennis Center hosts over 30 major mixed-league, tri-level and United States Tennis Association (USTA) tournaments. The USTA is considered the aspiring tennis player’s pathway to tour-level competition. This space is a frequent battleground for established professionals and amateurs alike. The “Road to the U.S. Open” starts right here in Daytona Beach, and you can get in on the action on your next visit. 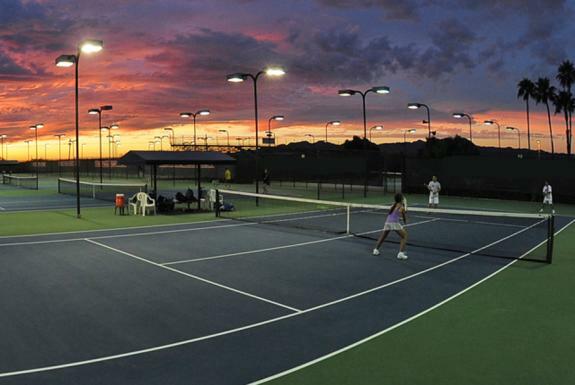 For Daytona Beach-area locals and extended-stay or seasonal visitors, the Florida Tennis Center provides a number of programs designed to help aspiring and established tennis players of all ages. From kids’ camps to adult private lessons to the “ball-machine club,” you’ll find what you’re looking for here. The Florida Tennis Center is the proud home of several top-tier tennis coaches for both beginners and tournament-level players. The center will even coordinate a match based on your ability level, even if you’re just in town visiting! Forget to pack your racquet? No worries — the Florida Tennis Center’s Pro Shop has you covered. The shop carries name brands like Wilson, LBH, Tail, Thorlo and so many more. Their professional racquet-stringing service offers a selection of high-performance strings, replacement grips and a one-day service. Plus, you can pick up any tennis apparel, accessories and equipment that you will need. For a full list of pricing and programs, visit the Florida Tennis Center’s website, and for the full Women’s Pro Championship line-up of events, visit protennisdaytona.com.